Can you feel it? Can you feel the heat? 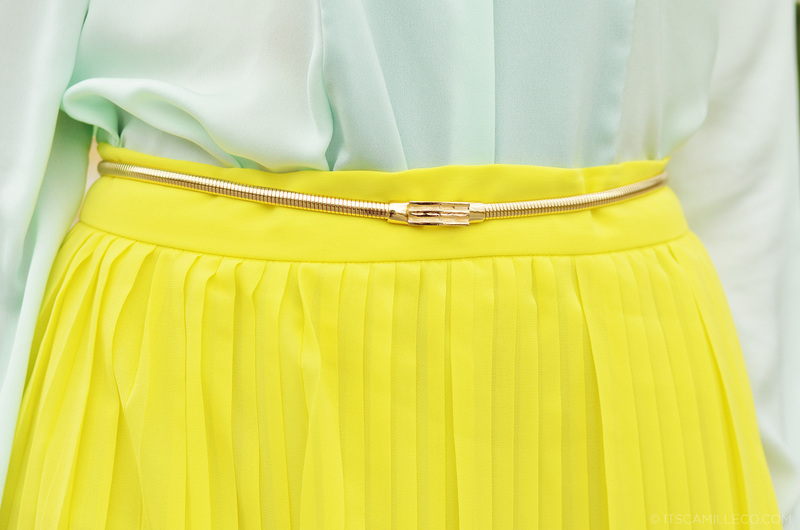 It means it’s time to bring out the pastels and brights! For today’s summer look, how about a sweet number? Scratch that, make that THREE sweet numbers. For those of you who loved my yellow pleated maxi skirt, you’ll love this shorter version even more especially if you’re one of my petite readers who has been looking for a similar skirt that wouldn’t swallow her whole. It’s in the perfect length–not too short, not too long. You can wear it on casual days AND to the office! It’s such a versatile piece. Don’t believe me? See for yourself! Say you want to stroll around the park, pair your yellow skirt with a summery top like this one. I’m sure you’ve been seeing these tops everywhere! I’ve been buying them left and right. I can’t seem to have enough of them because the heat is killing me and they’re the best when it comes to fending off heat while still enabling me to look decent. They’re loose too so that helps. I hate sweating in fitted clothes. Hate hate hate. And can I just say how much I love the color of this top? Lakas maka-girl! It’s so feminine and soft. The little sheer fabric in front adds a little sexiness to it too. For those of you who aren’t comfortable with baring too much skin or need a jacket to keep them warm in an airconditioned room, my suggestion is to add a denim jacket over your top. Denim makes layering seem casual and summery still. I just love how summer dressing always looks so young and fresh. Now that we got our casual look down pat, here’s a little something for the working girls. Tote bag for the office? Check! Now, who said you can’t dress for summer in the office? All you need is a little help from Mango. Follow MANGO on Facebook, Twitter, YouTube, Instagram (@Mangofashion) and Pinterest. HI =) I tried the skirt. but seems quite low and loose. i tried on size 6 and doesnt ook as high waisted as yours. Did you alter your skirt?? Welcome back!! :) Thanks Kim! I just noticed that you’re wearing all Mango apparels. Certified Mango Babe! Wow, I love both looks! But the first one is amazing simply because of the denim jacket! Totally up-ed the look 100 times! Sweet spring, quickly come to Poland! Yes I do :) I use Nikon D7000 :) Thanks Liezel! Kindly watch this video to see how animals are suffering for the sake of fashion and experiments. Kindly spread the word. Thank you, in behalf of the animals! Your look is so refresssshing! You’re so pretty as always!! I wonder why you’re still single. Are you kind of keen with guys? Hihi. I just wonder why you smile like that. :) Did you undergo a surgery? Haven’t seen you in a big laugh. Hehehe! Love you Ms.CC !!! Hi camille! Really love your style and it only gets better and better! I wish you can do posts about online shopping from international websites since.. That would be a great help to recommend websites that has great selection of clothes, unique and most of all stylish! Thanks and stay pretty! I love love love the casual look! You look so sweet, Ms Camille! such a simple yet chic look! the skirt is perfect for short girl like me! =D and I can feel the heat just by looking at the picture.. but it’s been rainy day here in Malaysia.. weather rant again.. haha.. Thanks Christine! Oh no, rainy hot weather. So humid! yeah.. it’s hot and cold these day.. and there’s flood in some places.. sigh..
Oh no, I hope it gets better! Haha! Talagang may ranking! :) Thank you Raxelle! I love this look! Soooo pretttttty and elegant! You’ve always been my style inspiration especially on corporate looks. As a law student, I can’t just be on a casual attire anytime and always. Fantastic Ms. CC! Very refreshing, pretty and nice. 3in1 ang peg! clap clap clap:) You’re the best! such a pretty skirt!!!! !…..it looks more prettier because of you….!!!! I wants to follow you but I don’t see it! I see this picture on mango page, I like it you are beautifull! Isn’t almost everything from Mango? I’ve noticed that when your wearing pastels, your skin is looking more younger or shall we say youthful! Have you noticed that too? And when I saw you wearing this outfit, it helped me forget about the hot summer and just feel breezy. And yeah, I do notice it. Pastels can really do that to fair skin :) Thanks Ren! hhuuuuaaa totally love this post! sooooo spring! i love pastel and u make me jealous of all pastels collection you had. It’s super full it’s not even funny anymore! I’ll buy more pastel color because of this post :)) I love Mango!!! Really?! When is Bloggers United 5??! Wow! You look divine! Super bagay sayo yang “summery top” na yan! Looooveeeeettttt…. I loved the combinations you made, matching the colors and styles! I never could imagine that this “social” clothes could match perfectly with a denim jacket! Love your simple top and necklaces! PASTELS! I loved how you styled in different ways this yellow skirt! Clap Clap! Master stylist ka na talaga lol. Bow! Haha! Thanks Katrin! :) I’ll make my assistant kulit to teach me how she does this! I love it too! Thanks Marie! Cool outfit! Perfect for this weather! WOW! Super duper Like!!!!! :) Thank you for always sharing brilliant ideas in dressing specially always considering the different type of people such as the conservative types and not..^^. you are always balanced Ms. Camille. Thank you Marichelle! :) I try my best! Thank you, really! Oh i see! thanks for the tip! I’m so sorry i just have to ask again, hahah! what camera could you suggest? TIA! Your outfits are always simple yet beautiful. They’re easy to get inspiration from, too! Always, for summer! :) And yes, this top is a must-have! spring is everywhere but in the czech republic :( adore this outfit ! Awww I hope it arrives soon!